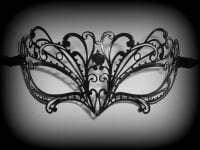 Designed in white painted laser cut metal & as you know white is the masquerade mask colour to be seen in this party season. Stand out from the crowd with this striking Ricciolo Mask by Simply Masquerade. 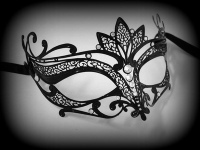 Perfect for elevating both a fancy dress party or posh masked ball to new heights! This gorgeous pure white masquerade mask features intricate metal scrolls that wrap around your face. 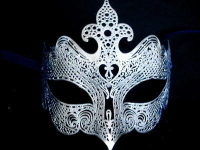 Get maximum designer credentials with this beautiful handmade filigree mask - perfect for turning heads wherever you go. Petite fitting which will fit most face types & fitted with classical satin ties for comfort & security so you can party all night long.